Swimming with sharks in Bora Bora. First of all I need to be clear, this is not about free swimming with a really dangerous shark, like a Great White, a Hammerhead, a Mako, or a Bull shark. 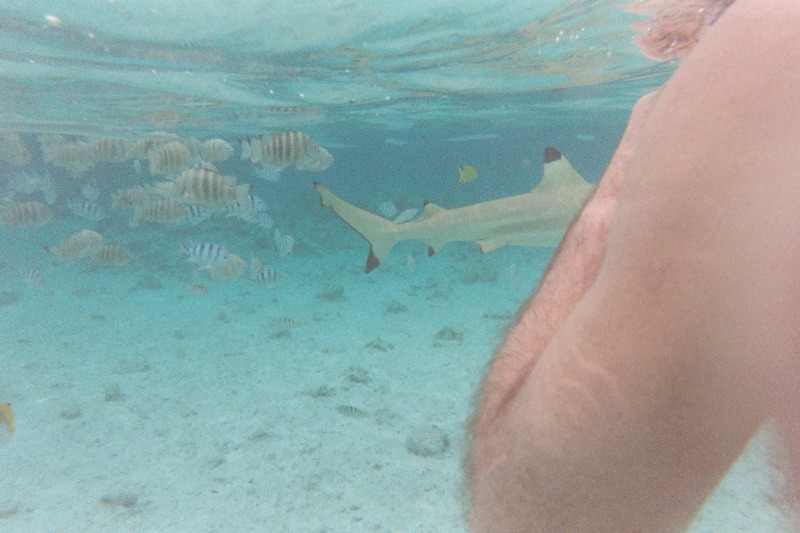 This is about swimming with medium sized sharks in Bora-Bora. But wow! What an experience. 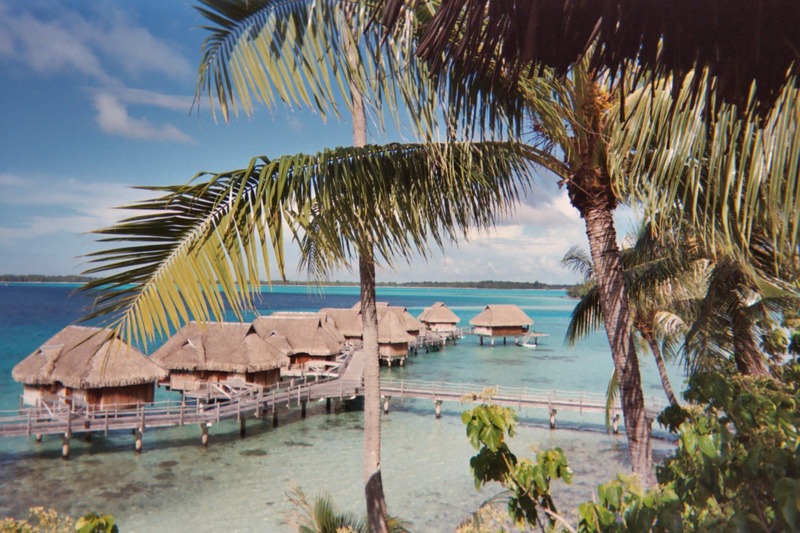 My wife and I were on a 20th anniversary trip that included a week long stay on a really nice private Motu in Bora-Bora, the Sofitel Marara. 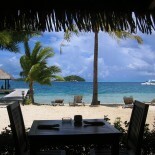 Very quiet, very secluded, with its own beaches, and you can only get there by water taxi. You want private? This is it. Anyways, when you combine the solitude of your own semi-private South Pacific island with the romance of an anniversary trip and an over water bungalow, well… It was a few days before we did any exploring. 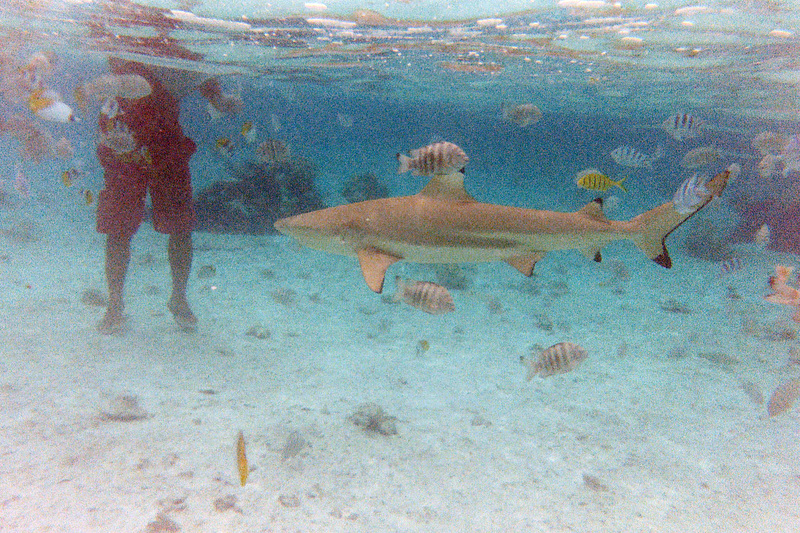 But one thing I heard about was the opportunity to do some skin diving (mask and snorkel) with sharks. Hey, it sounds like fun. At least to me it does. My wife was not quite so sure. When the day came, we were really lucky. It was the first (and only) day that the skies were cloudy, and that was a very good thing. The sun down there is as intense as you can imagine it to be, and being out in a small boat all day without any shade could be an issue, except we got lucky with the clouds. Normally you might not want a cloudy day on a vacation. This was an exception to that rule. So our guide shows up at the beach in a very comfortable fiberglass canoe with an outrigger, and we joined a couple from Germany for this day long trip. 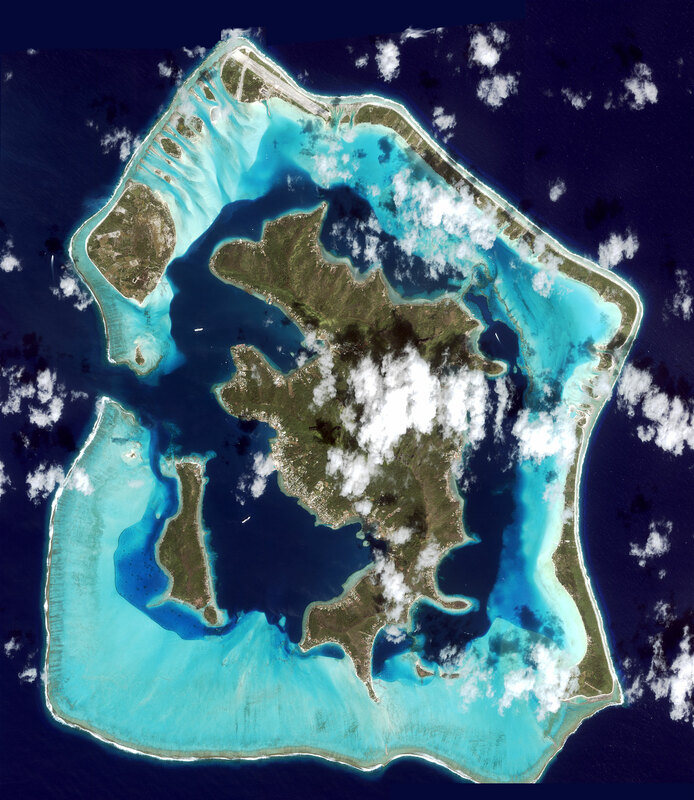 The journey would take us all the way around the entire center island of Bora-Bora, with a few stops along the way, one of which would be swimming with the sharks. That’s our guide below, playing the ukelele (and singing) which he did all day. 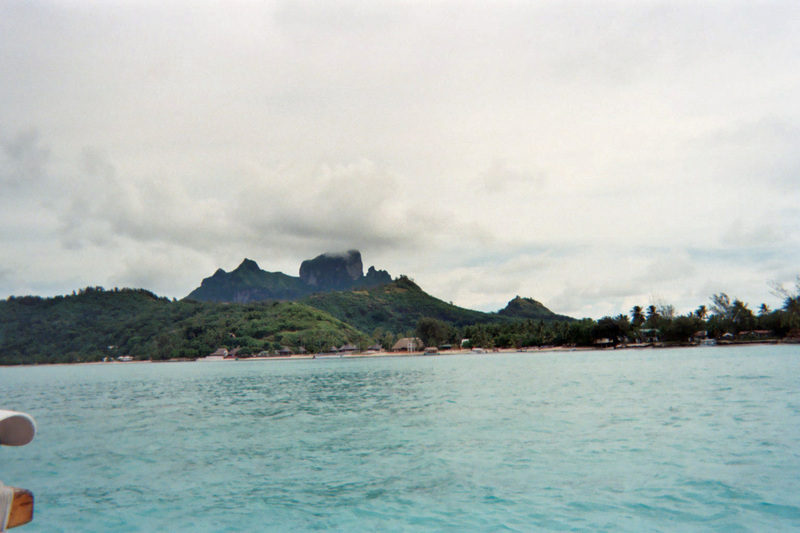 The trip around Bora-Bora was absolutely breathtaking, and even without the featured attraction of swimming with the sharks, the ride alone was worth it. 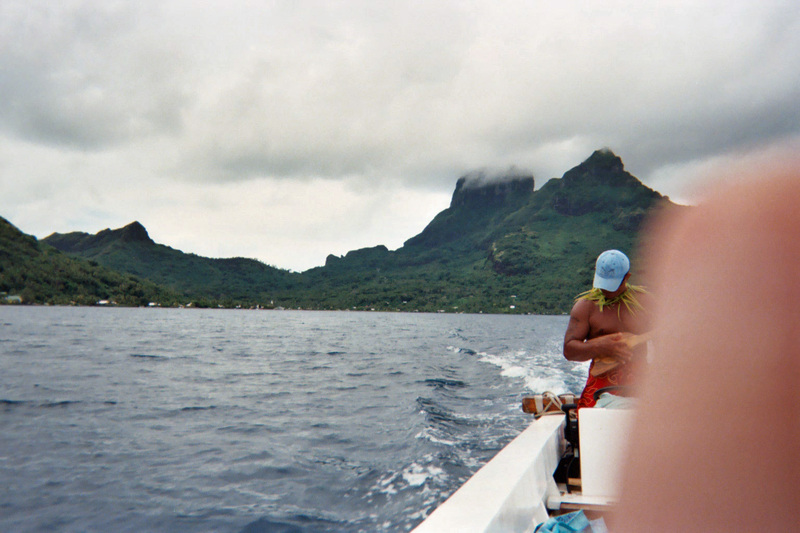 After we had eaten lunch on a private little beach beneath some coconut palms, we headed out towards the outer edge of Bora-Bora for the sharks. Our guide explained that these sharks are wild, but they have become used to being fed and having swimmers with them in the water at this particular place/time every day. So he was telling us that the risk is low, but it is not “no risk”. Although this was awkward for the ladies, he also asked both of the women if they were having their periods, as he would not allow them into the water if so. Fortunately, that was not an issue. We get to the spot and he drops anchor (actually just a concrete block with a rope on it) and puts a small rope ladder over the side. We are firmly instructed to stay between the boat and the pontoon outrigger, and not to be swimming alone. 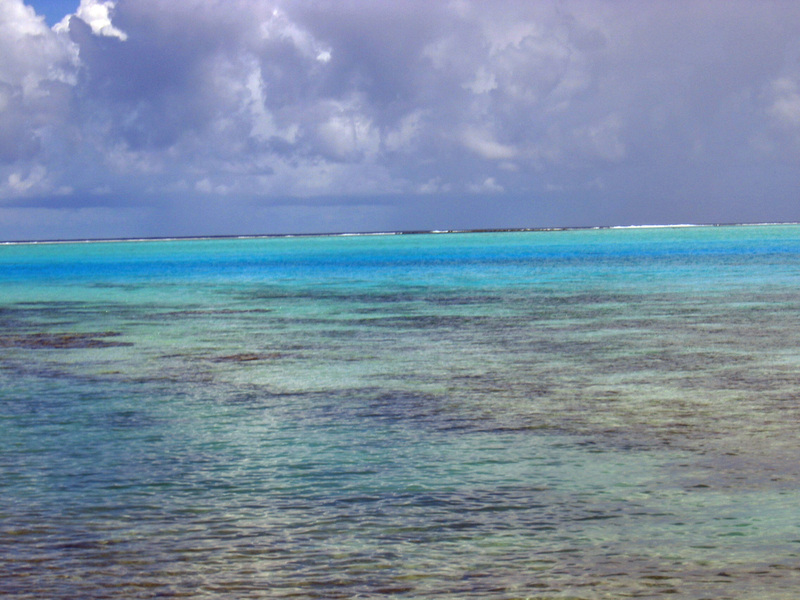 The water here was about 5 feet deep, and mostly sand, with just a few coral outcrops. Even while sitting in the boat we could see schools of fish gathering, and the first shark. Just a baby, not much more than 3 ft (1m) long. So here we go, over the side and into the water. It was shallow enough that everyone could easily stand, and duck down using our masks and snorkels to watch the action. The 4 of us started out close to each other, and then we drew even closer together as the guide started throwing chunks of tuna into the water. At first, just the fish came darting in to get the bait, but very quickly they were replaced by the sharks. 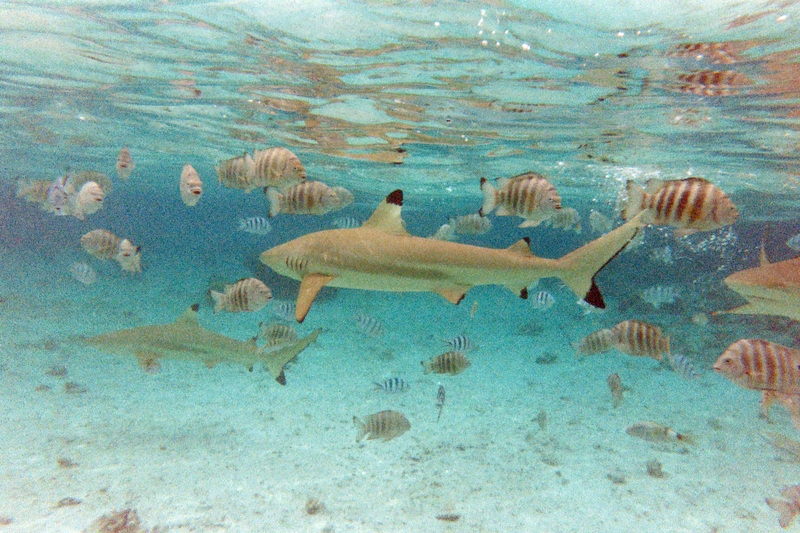 These were black tipped reef sharks, a small to medium shark, commonly around 5 ft (1.5 m) long. I had done some reading ahead of time, so I knew we could expect mostly 3 to 4 ft “teenaged” sharks, old enough now to leave the shallowest lagoons, but not old enough to leave the island for deeper water or the open ocean. A reassuring thing the guide told us before we got in the water was that since these sharks were smaller than us, they were extremely unlikely to get too close, as we are large enough to be a possible threat to them. If we did get concerned or worried, we could climb up&out at any time. He also said that sudden aggressive motions (by us) would be very effective in deterring them if they got too close. Then he smiled, grinned, and said “usually”… Ha ha ha. OK, what an experience. 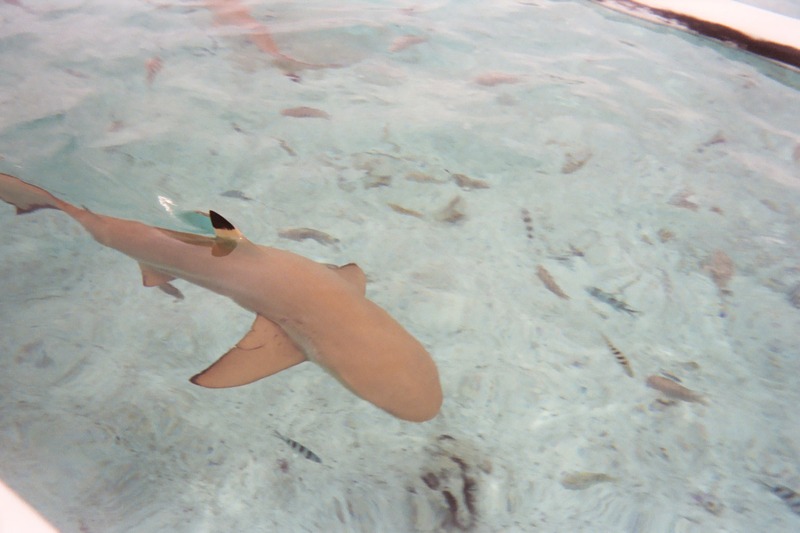 The day before, I had bought a disposable one-time use underwater camera. That turned out to be the perfect thing to have with me. 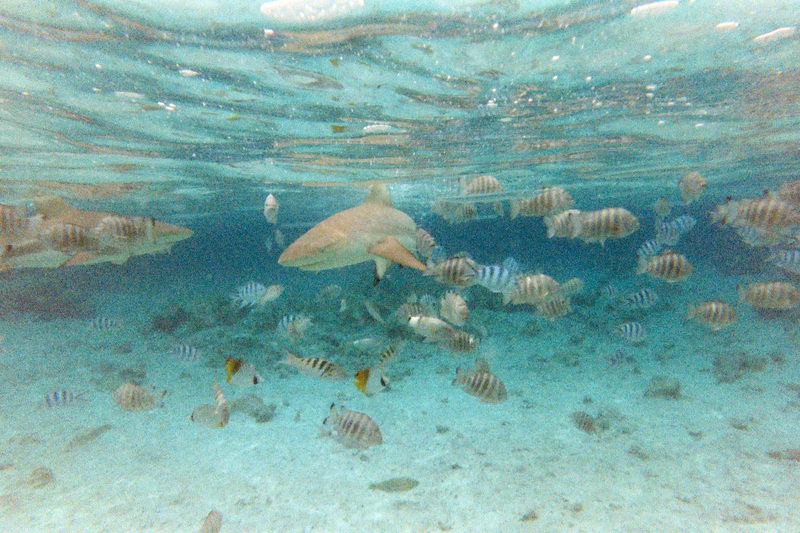 I could stay underwater breathing through my snorkel, and swing around to watch all the sharks (and the fish) as they moved in and out for the bait. We started with just a couple of sharks, but as time passed more arrived. And they kept on arriving. From 2 or 3 it became 4, then 5, then 6, 7, 8. Not really sure how many finally showed up. But as their numbers increased, so did their attitudes. They were clearly getting into a competition with one another for the food. My wife and the German lady bailed out and got back into the canoe when 2 much larger sharks showed up. These were fully grown adults, at least 6 ft long (1.9 m). I am not a shark expert by any means, but when these 2 arrived, I immediately sensed and saw a sudden difference in the behavior of all the sharks. While the first few sharks were swimming slowly and being very casual, except when darting to get bait, things had dramatically changed. Now all the sharks were looking amped-up, making faster turns, their fins are at a sharp angle, their mouths are staying open, and one of them had this really aggressive looking humped back posture that he was taking. After a few more minutes, the guide directed the German gentleman and me to go “up” indicating it was time to get back in the boat. We climbed up, the guide followed. Then he said “watch this”. He dumped the remaining fish, and whatever juices had collected in the pail, into the space between the boat and the outrigger, right where we had just been. The best description I can give is that the water just exploded with thrashing tails and fins as the largest sharks fought each other for those last scraps. We certainly would not have wanted to be in the water for that! But, if you ever get the chance, pick up an underwater camera, slather yourself in SPF50 waterproof sunblock, and go swim with some sharks in Bora-Bora. Great adventure — kudos to your wife for joining you in the water. Here’s a tip: when you hear the music going dum-dum, dum-dum, dum–dum, it’s time to get out of the water (learned that at the movies). I agree about the cloudy day: I got a fluorescent sunburn one time snorkelling at a water park in the Yucatan. Great movies, but nothing like that at all in reality. It was just a blast. Love your photographs. Such a great memories. Thank you for sharing these. 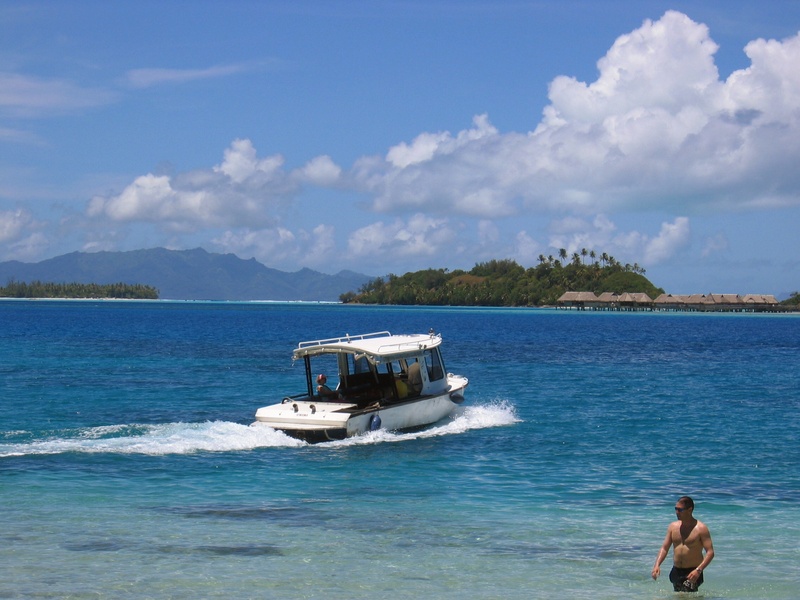 This entry was posted on February 17, 2014 by jlroehr in Passenger thoughts and tagged BoraBora, feeding sharks, French Polynesia, skin diving, Sofitel Marara, Swimming with sharks.